One of the members of Haven who was very close to retirement shares how God showed her a different path. It was such a great encouragement to see such obedience and the blessings that follow. I am 61 years old and have been contemplating an early retirement from Kaiser Home Health when I turn 62. I have been envisioning planting a garden of homegrown herbs, fruits and vegetable so that I can cook and pick what I need for my next creative meal. God has another plan for my life. He has called me to serve at Grace Community Home Health, a faith-based home health agency. Grace Community is a startup home health agency with an openly Christ-centered mission and vision. When one of the partners approached me to share about its core mission and vision, my response was, “Where have you been all my life?” It was the same mission and vision as my heart’s desire and personal mission as a physical therapist. I have always believed that God called me into this field as a platform to share His love in a practical way. On May 5, 2015, I officially retired from Kaiser, and am working full time as the rehab director for Grace community Home Health. Grace Community is currently providing pro-bono services until we become accredited with the Joint Commission, which then allows us to bill our services through Medicare. We are a for-profit organization with goals to be self-sustaining, to continue to serve the community, and to support missions around the world. I would greatly appreciate your prayer as I start this new stage of life. Would you join me in praying for the following? For favor with referral sources, hospitals, rehab facilities, and physicians. We want to be a representative of Jesus Christ. Thank you for your love and prayers as I embark on this career change. 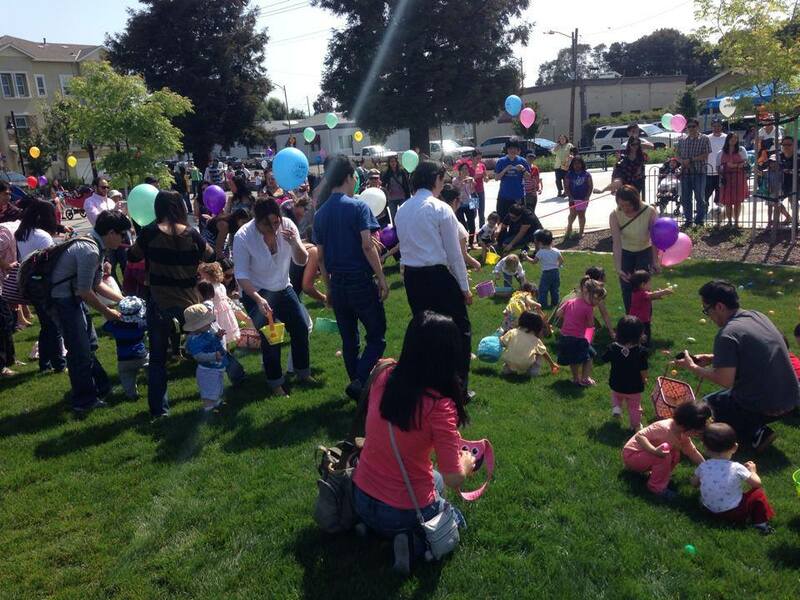 We will be celebrating Easter again for the second year at Newhall Park San Jose. With families from our community residing in the area, it seems to be a fitting place to celebrate and meet new friends. 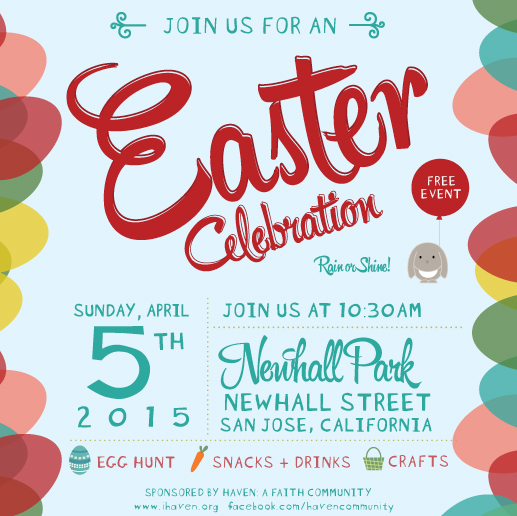 Join us for this FREE Easter Egg Hunt and celebration of Jesus with us on April 5, 2015 at 10:30am. RSVP is not mandatory but would be helpful. All are welcome to join! There will be an epic egg hunt including a separate egg hunt for the younger kids. There will also be crafts, food, and new friends to make. Rain or Shine! Map of Newhall Park in San Jose. 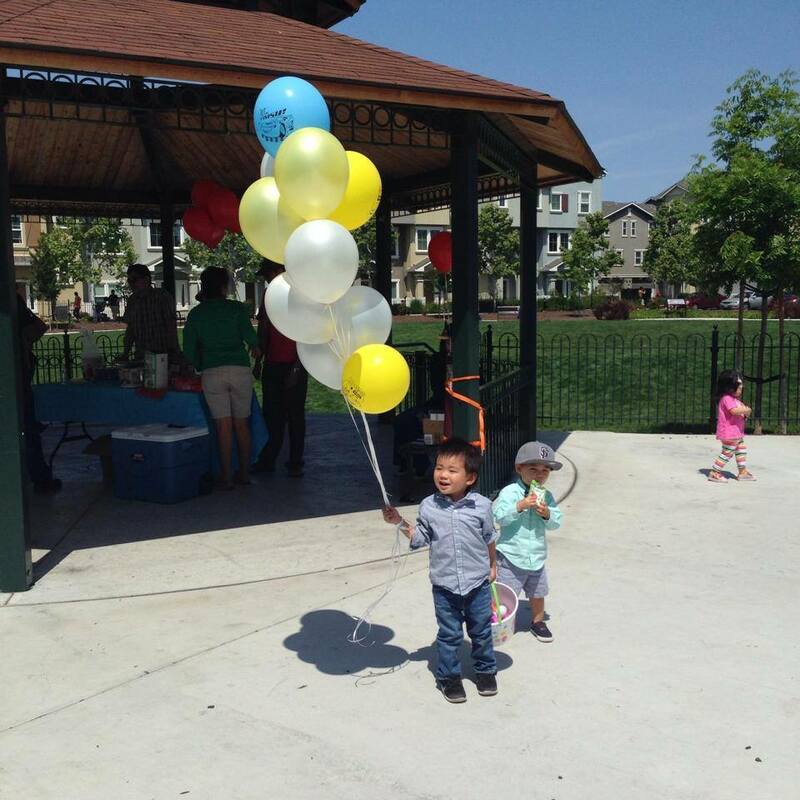 We celebrated a big gathering at the Newhall Park in San Jose with our friends and neighbors. It was a great time of celebration and fun with the kids and getting to know our neighbors. 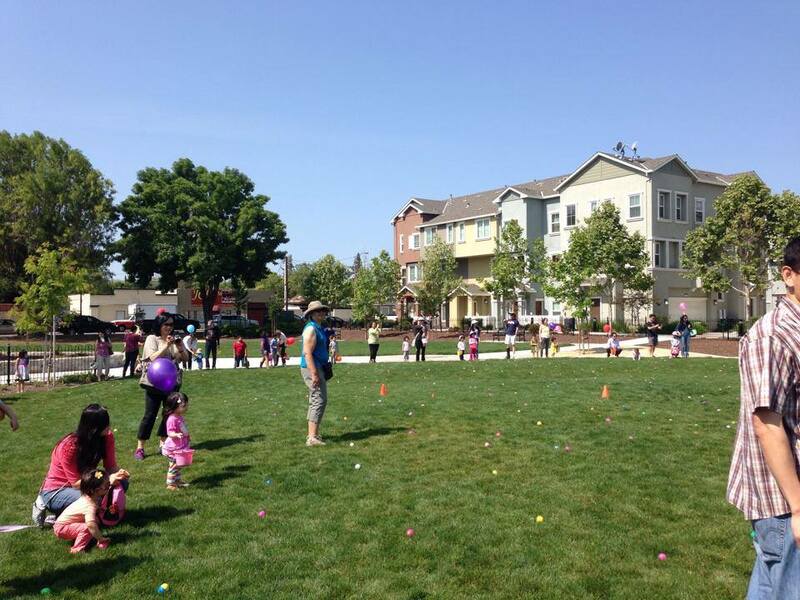 Members of Haven live in the complex next to Newhall Park and thought it would be a great way to build community and meet their neighbors by hosting the Haven Easter Celebration at the park near their home. It was our first time throwing a very largely advertised event. We had no idea who was coming and only 5 people had RSVPed on the Facebook event page though no one was required to RSVP. We weren’t sure how many eggs or snacks to buy. About 80 kids & parents showed up it was just enough for everyone. It echoed the message the Jesus love for us is enough. We had a great time with delicious snacks and good conversation. Can’t wait until the next one! The big kids egg hunt. Waiting for the green light to attack! The little kids egg hunt getting ready! The young ones going for it! Balloons were a big hit. So were new and old friends! We will be having an Easter event including a short sharing time and tons of fun for the kids. It’s a FREE event and all our welcome to join! 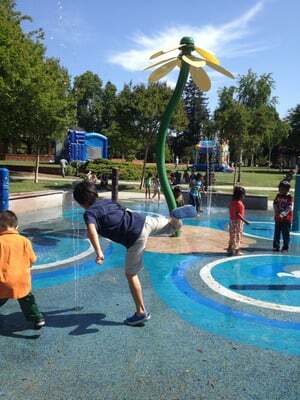 10:30AM at Newhall Park in San Jose. For more information, email us or check our Facebook page for updates! Rain or Shine People! One of our community projects this year was to pass out care packages. After having one of our old house community members be homeless for three months, he shared our experience with us and what items a person might need in his previous situation. In our care packages, we put in soap, socks, toothbrush with case, shampoo, mouth wash, detergent, notebook and pen, comb, wash cloth, antibacterial, granola bars, band aids and few other items. The idea was to pass them around year round but also to have people in our own networks join us–this could be family members, coworkers, friends and have them have their friends join in. Haven would just continue to sponsor these packages. They have no notes in them, no literature. The idea is to give with no strings attached-a pure and genuine act of love and kindness. “I went to San Francisco today. I always knew there were a lot of homeless there, but I never really truly paid attention to how many there were until today since I was actually looking for them. I drove all over SF, and the streets were just riddled with homeless men. In my short time there, I saw well over a hundred of them. Some had shopping carts, others had backpacks. Many had nothing but a donation cup. My first stop was SOMA near ATT park. There were quite a bit of them roaming near the embarcadero, but I decided to give the first care package to a guy trying to write a HELP me sign on a cardboard box. I simply went up to him and said, “Sir, this is for you.” He looked at it, and said “Thank you thank you thank you.” As I walked away, I looked over my shoulder, and it was like watching a kid in a candy store looking through the bag to see what was in it. My next stop was Union Square. A guy was walking up/down the red light asking for money. I simply opened my window at the red light and instead of giving him money, I gave him the second care package. He said, “God bless you, sir”. Some onlookers were watching and wondered what I had given him. The light turned green, and I drove away. Through Chinatown I drove, I gave the 3rd care package to a guy sitting on the sidewalk picking at his barefoot while his torn-up tennis shoes were sitting by his side. It was a nasty nasty thing to see. haha, but I handed him the package and said, “There’s a pair of socks.” He just looked at me dumbfounded. Completely speechless. Not one word. I smiled and walked away. My last stop was the other corner of SF. The she-she area of Fillmore district where all the fancy mom/pop stores are. 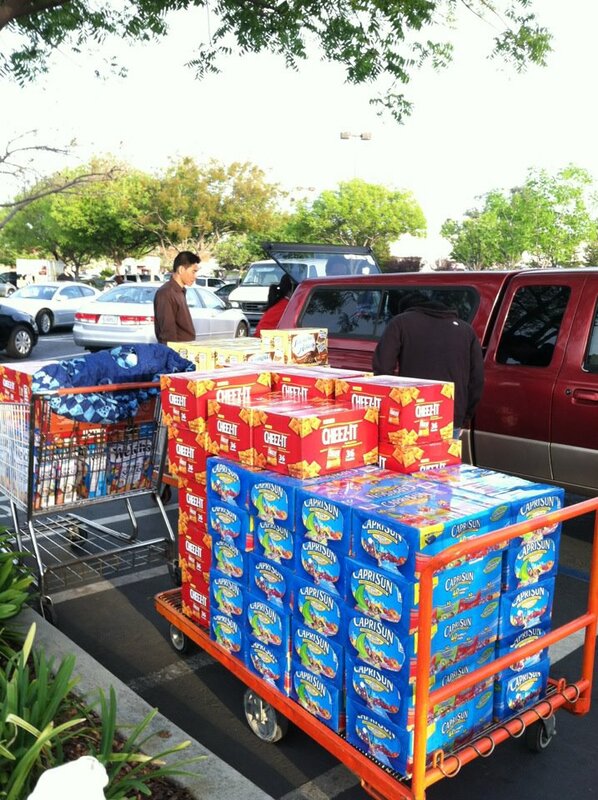 I walked up to a guy with a loaded shopping cart. I stopped him when he was about to cross the street. Kinda made me feel bad since he struggled a little to get his heavy shopping cart back onto the sidewalk. He too gave me a wonderful God bless u. 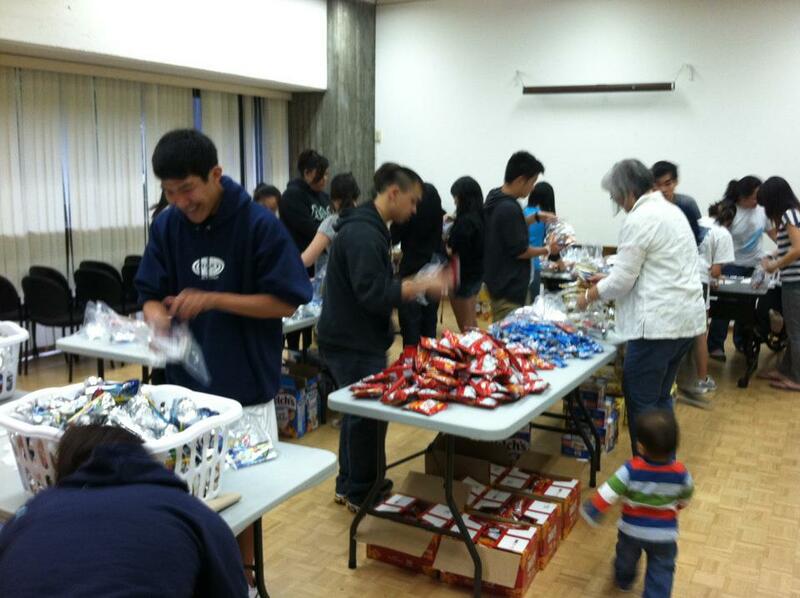 Here is one of the groups packing them during Christmas. Even the little ones enjoyed helping. 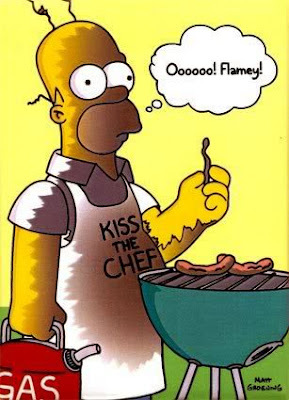 Join us for a fun summer BBQ event. All are welcome to join. All are welcome to come. Please also specify if you do have food allergies or restrictions. RSVP BY AUG 21 if you can so we can have enough grub for everyone! We will be having an Easter Sunday celebration at 10:30 AM at John D. Morgan Park in Campbell on March 31. Join us and invite all your friends, coworkers and family! All are welcome. There will be free lunch and Easter Egg hunt for the kids. Most importantly, we will spend some time talking about Jesus. Please help us by RSVPing on the Easter page if you plan on attending so we can prepare enough food. In the Fall finals of 2010 Haven partnered with the San Jose State Asian American Christian Fellowship (AACF) to find a way to love the student community during finals week. An idea to make “survival packs” of a Capri drink, granola bar, mini-cookie pack and chewing gum to hand out to students studying for finals. That quarter, 250 packs where assembled by the Haven house church and accompanied AACF members to hand out free packs to students without any speeches or “strings attached”. If someone would asked we told them we were showing love to the SJSU community. At first, the givers and receivers were both wary of what this was all about. Only 250 packs were given away and AACF experienced a different way to “love” their fellow students. In the Spring finals of 2011, 500 packs were made by Haven. More AACF members participated and word got around the library of free packs. Students were looking for the packs at the library . In the 2012 Fall Finals, AACF were embolden to not only hand out packs but to also assemble the packs as a part of their fellowship meeting. AACF/Haven assembled 1000 packs and handed out not only at the library but also at the engineering college and fine arts college. Word began to reach to many students and now there was anticipation during dead week to receive a survival pack. Conversations were beginning to take place between givers and receivers. With a thousand packs, AACF asked other campus fellowships if they wanted to hand out packs and the fellowships partnered together to hand them out. Spring of 2012 saw this little seed grow. As AACF/Haven packed one thousand snack packs, the AACF leaders shared how the other campus ministries are looking forward to hand out the packs and to share time with the student community. 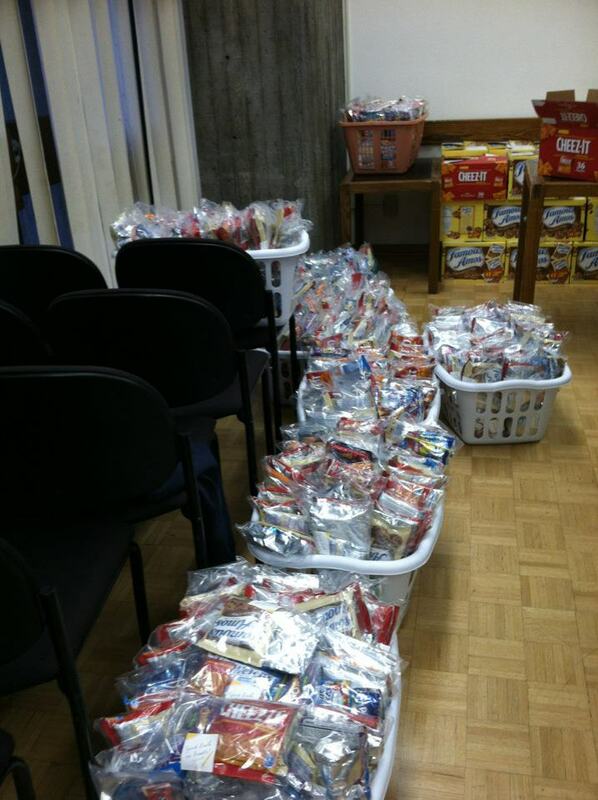 Another church heard from their college students of this and they were encouraged to assemble snack packs for their college group to hand out during finals week. This started because two of our brothers felt a need to find a way to love the San Jose State students. The Lord brought the resources, the brothers and sisters together to bring a blessing upon those would were thirst and hungry. Assembly line with little guy keeping everyone in line!